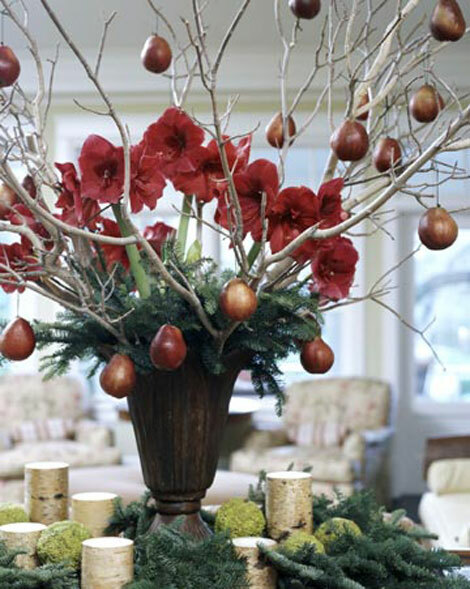 I can’t think of anything more fun than decorating for the holidays with the sound of Christmas music in the background. It’s even more fun now with the little ones. Every thing I bring out makes their eyes even wider. I love the lights and greenery. 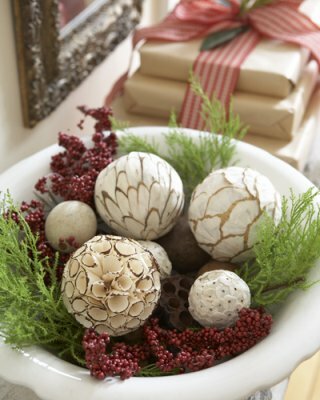 If you listened to the radio show (http://www.blogtalkradio.com/atmosphere-id-) I gave 3 simple decorating tips for the holidays. The first tip was to use 1 color as the dominant color. No matter what color you choose, be sure that you use it more than 35%. It should be your main color. I mentioned that green can be a great color for Christmas, in a variety of shades. 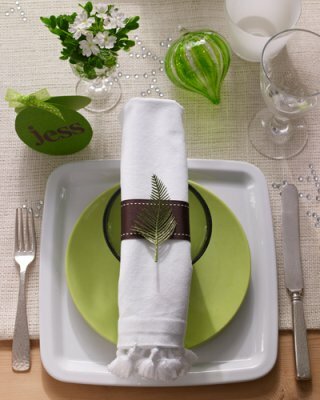 Here it is the main color and repeated throughout the table. Be sure to repeat the color throughout the space. Tip #2 was to to use a natural items. Now, going natural isn’t always easy because of the cost involved. 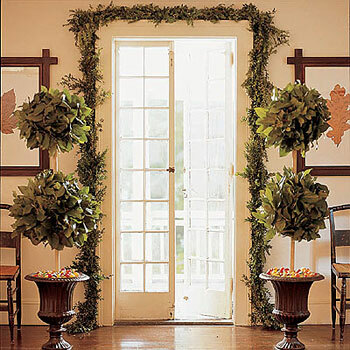 Think garlands over doorways and up stately railings. You can always save a little by using natural sprigs on light shades or candles. My 3rd tip is about using the right scale. 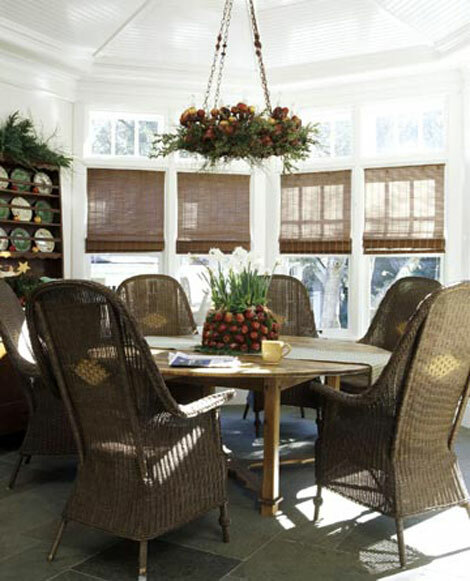 One large item or groupings make much more impact than smaller pieces scattered around a space. 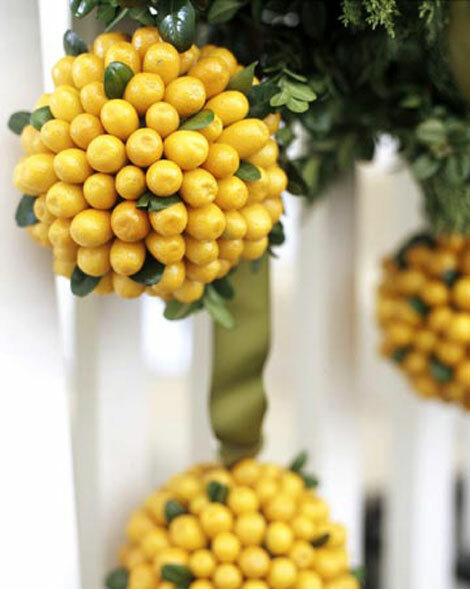 Take this great balls made of kumquats. By grouping items together they make a greater impact. Not to mention the awesome pop of color. This is a great look for a holiday party. 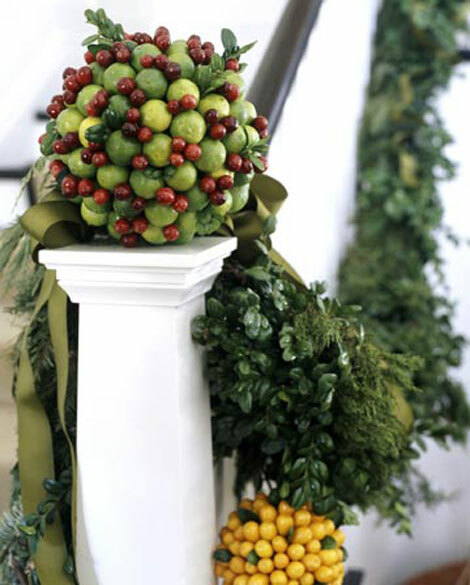 The greenery here makes a big statement. Much more “atmosphere” can be created by these larger more stately pieced, even if they don’t scream Christmas like a bright gold star. I hope you enjoy the wonderful feeling associated with Christmas lights and decor. What a wonderful time of year! If only it would warm up in January….